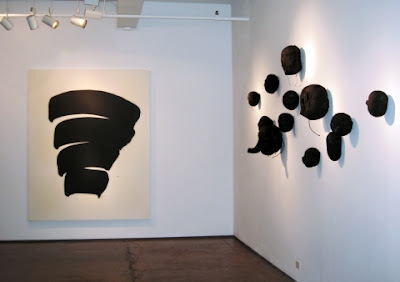 On view at the Nicholas Robinson Gallery in Chelsea until October 22nd, 2011 is the work of Korean, Paris based artist Lee Bae. The exhibit titled, The Conceptual Formalist is curated by Sam Bardaouil and Till Fellrath of Art Reoriented and is the artists first solo with this particular gallery. The work on display derives from three particular series and represent the artists interest and participation in the Korean Monochrome Movement. His pigment of choice: Black. Lee Bae makes work using various means. 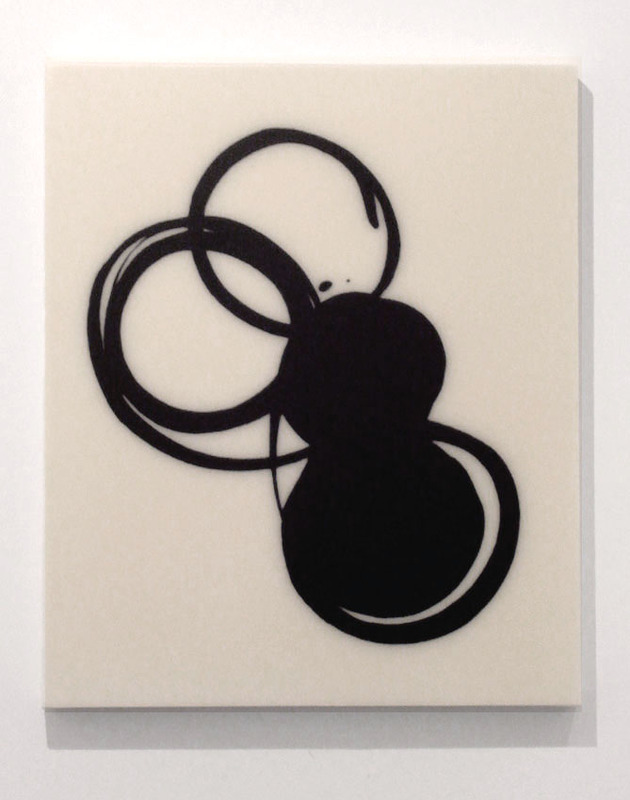 He is interested in forms that are both naturalistic yet could also be referred to as organic geometry. This holds true especially for the bundles of charred wood that stand, sculptures installed, within the main floor of the gallery. Remnants of burnt timber flake away and remain in small piles of dark dust around each piece. What remains of the wood is angular and due to the binding of the string, purposeful. These sculptural works appear to be less about accident especially in comparison and juxtaposed next to his wax paintings which carry a weight of presence but seem to rely more on happenstance once the chosen medium is applied to canvas. Such is not the case for the sculptures or the drawings. They both occupy a particular space that is designated by various implements and/or physical constraints. Each body of work has a different surface value and texture. The paintings are matte. The finish is smooth and consistent and begs the viewer to cut into it as if icing on a conceptual cake. 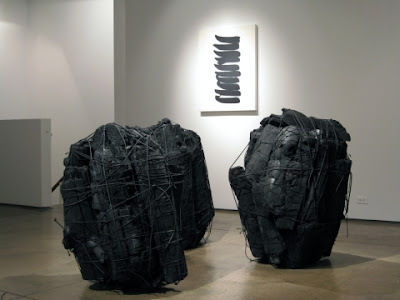 Technically, the work doesn’t necessarily offer something new but within and between the Formalistic qualities is a communicative thread that lassos not only the charred wood, but the Monochromatic sensibility. Because if you look hard and close enough into the form, you as a viewer will commence upon the journey of seeing shape and maybe also have a moment of recognition. The artist and curators have made dialogue. Which rather than it being closed, is open and invites not only an in depth discourse but also if you are in tune to read the subtle nuances, will lend itself to a psychological anti-narrative. Lee Bae has been mentored for many years by the artist Lee Ufan whose exhibition Marking Infinity is on view at the Guggenheim Museum in New York until September 28th, 2011. Special thanks to curator Sam Bardaouil for the invitation along with additional artist information. All photographs courtesy of Nicholas Robinson Gallery, 2011.